I trust that you are as excited about the arrival of spring as I am. That’s right, March 20th will mark the spring equinox, and we are already seeing signs of life emerging from the winter ground in Newport. For me, the start of spring is also marked by my winery work—it is time to get the white and rosé into the bottle, so that we can enjoy it with our spring meals (thoughts of prosciutto and peas over a pile of fusilli!). All of this language still feel so exciting to put down on “paper.” I have to pinch myself to make sure I am not dreaming. Jumping on a plane to fly to California, where the sunshine is abundant and the buds are about to break seems like a dream come true. How did this wine lady get so lucky??? Admittedly, bottling is the least fun part of the process. In part, because I can’t really get my hands in it, but also because it is a bit nerve racking. It is when things can go wrong, from something as simple as spillage (I have watched with great dismay as gallons of wine spill out of the tank onto the floor of the winery because the hose was not attached properly) to more serious problems of contamination. The truth is, I don’t do a lot during the bottling, just watch with bated breath and crossed fingers. That said, I was excited to taste the 2018 Viognier and Rosé of Pinot Noir, and to check in on my Grenache. Tipsy Rose 2018 Rosé is 100% Pinot Noir from Stanly Ranch. The is a switch from my two precious vintages, but I just did not have enough Grenache to make any rosé. Lucky for me, Nicole was kind enough to share some Pinot. I have said this before, but it is a reminder that wine making is 50% intention and 50% “this is what the harvest hands you, so get ‘er done.” In the end, I am pleased. The color is inviting, soft with a touch of salmon to the pink, and the fruit is easy and full of berry with a fresh clean finish. Yes, it is dry, but has good fruit. I love rosé made from pinot, it has great texture and tannins, with soft ripe fruit. Good for sipping on a Spring day with that pasta mentioned above, or an omelet with goat cheese and a lofty pile of lettuce in a light vinaigrette…and French fries, of course. A weighty white with abundant peach and tangerine on the nose, rich stone fruit on the palate and bright acidity on the finish. The 2018 Viognier is consistent with last year’s vintage. I owe it all to the beautiful fruit that we get. It is true that all the work is done in the vineyard. The wine has great front fruit, full-bodied and tons of aromatics of tangerine and peach, and on the palate it is rich, but has great acidity, so leaves my mouth watering and thinking about lemon sea salt shortbread and some camembert. I only made about 12 cases of each the wines, so get your orders in now. They will sell out fast! Each are priced at $22/bottle, but I am offering 10% off for pre-orders. 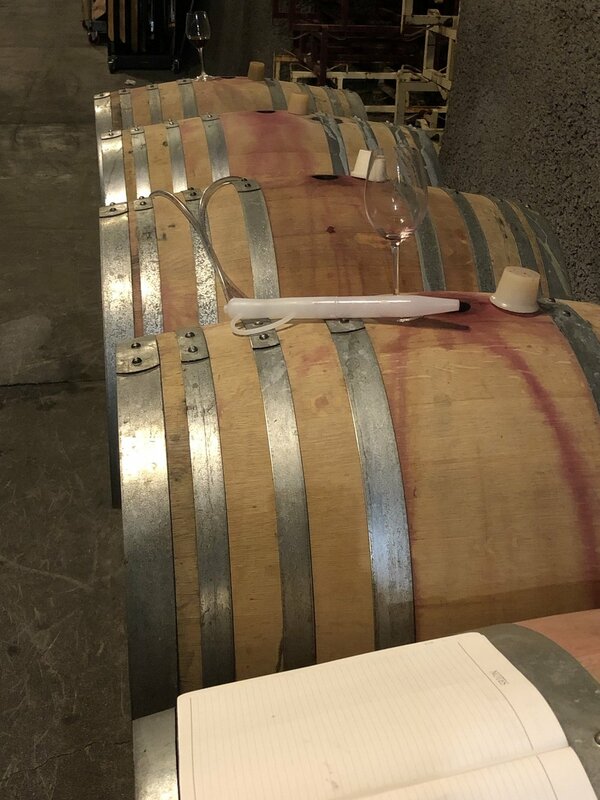 2018 Tipsy Rose Grenache is blended and racked, and is tasting great…watch for her in the shop this fall!